I am a major Popcorn Loving Girl! I could eat it every day…but try to stick to only on special occasions because it is hard to not dress it up and make it super fattening. 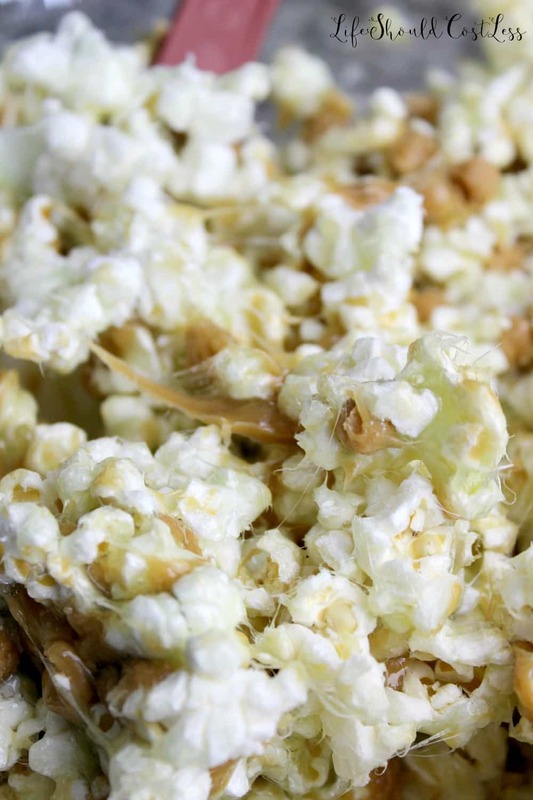 This recipe is actually a combination of two of my other recipes Caramel Apple Rice Crispy Treats and Jolly Rancher Flavored Popcorn Balls. The flavor combo is Sour Green Apple, Popcorn, and bits of Caramel throughout. I think it’s the perfect fall treat, but it can easily be made any time of year too. Before I start showing you all the process and share the recipe I just wanted to mention that my very next post is going to be my Great Grandmother’s Peanut Butter Cookie recipe. It is the best Peanut Butter Cookie Recipe ever and is actually also the best recipe to use when you are going to stuff the cookies with Rolo’s or any other delicious chocolate or caramely treat. Keep an eye out for it, I should have it posted within the next few days. Anyway, back to the task on hand. Here are the ingredients all laid out. 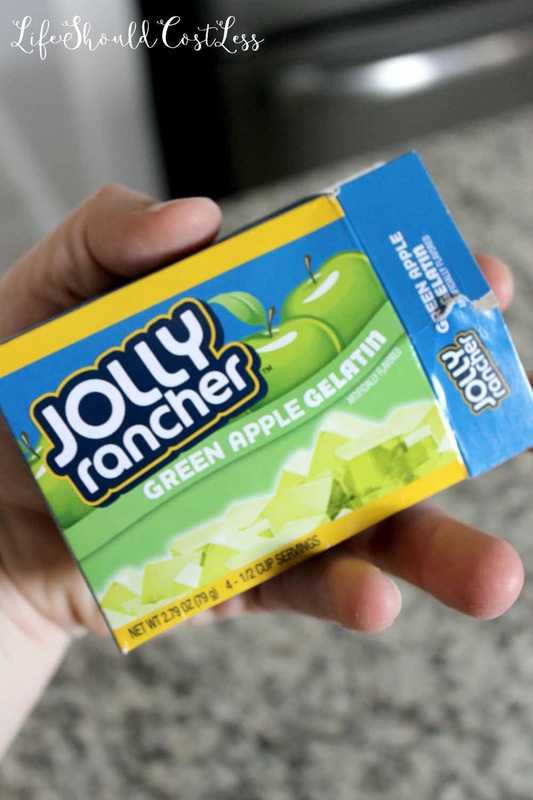 I added a couple of photos of the ingredients that not everyone is going to know what they are, this is the Green Apple Jolly Rancher Gelatin mix that the recipe calls for. I just get it at Walmart near the other Jello…I’ve seen it at Winco in the past too. 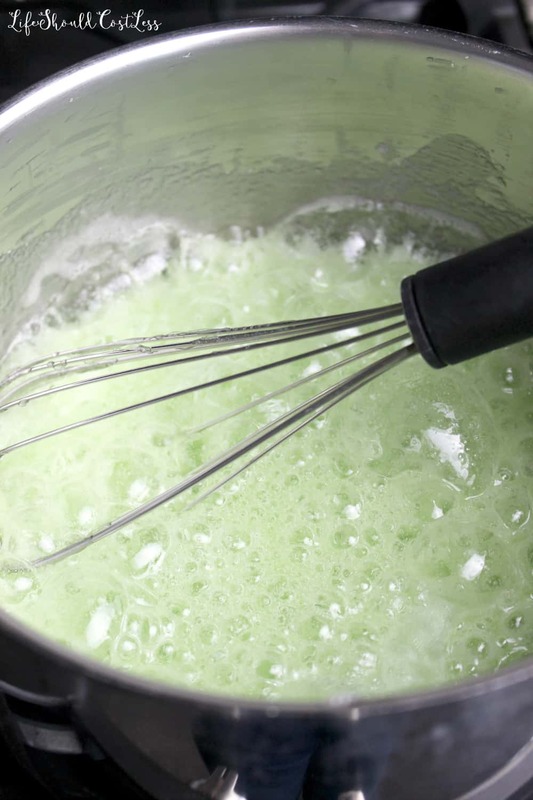 Here I start the process of making the gooey part of the recipe…it’s oh so good! Here’s what it looks like when you bring it to a boil for one minute. 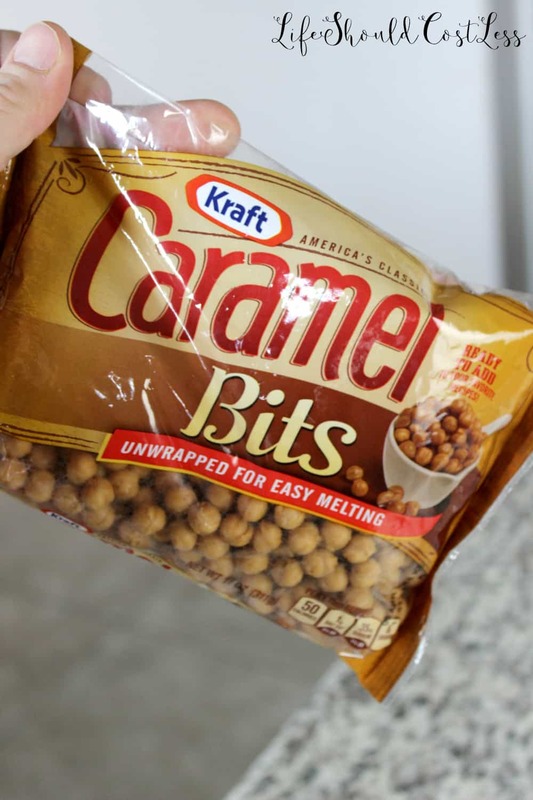 Here is a close up of the Caramel bits so you know what to look for. I usually buy mine at Walmart (next to the chocolate chips). Now is actually a good time to stock up on them as the price tends to go up significantly around the holidays. Here is my popcorn (with old maids removed) in a four quart bowl and I poured the caramel bits over it. 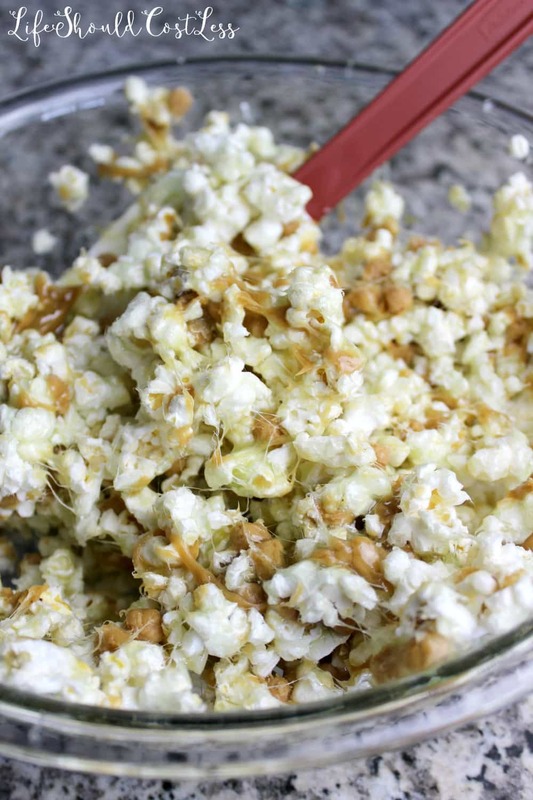 I’m thinking that the next time I make this I am going to mix the caramel and popcorn together before I pour in the Green Apple portion to prevent the caramel from clumping together. Try as I may I could not get a pour shot of adding the green apple part to the popcorn and caramel…it was just too hard to hold the camera in one hand and try to pour out of a hot pot…I burned myself trying and my kitchen was full of colorful language for a few minutes while I was trying, lol… I could really use a husband to help me with my photography, but you guys will just have to deal with my mediocre and limited skills for now, sorry. Here it is after I poured it in, right before it gets mixed in. 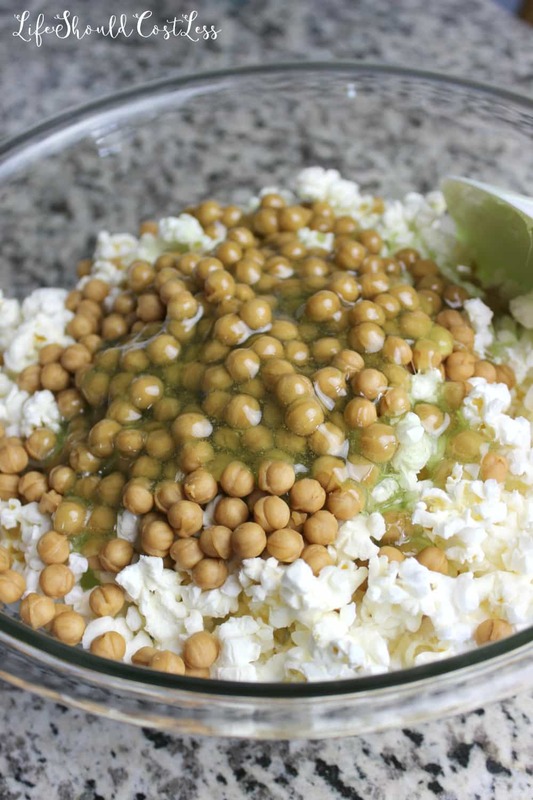 It takes a few minutes and a little muscle to mix it in, but it is well worth the effort. Now it’s done and ready to eat!!! 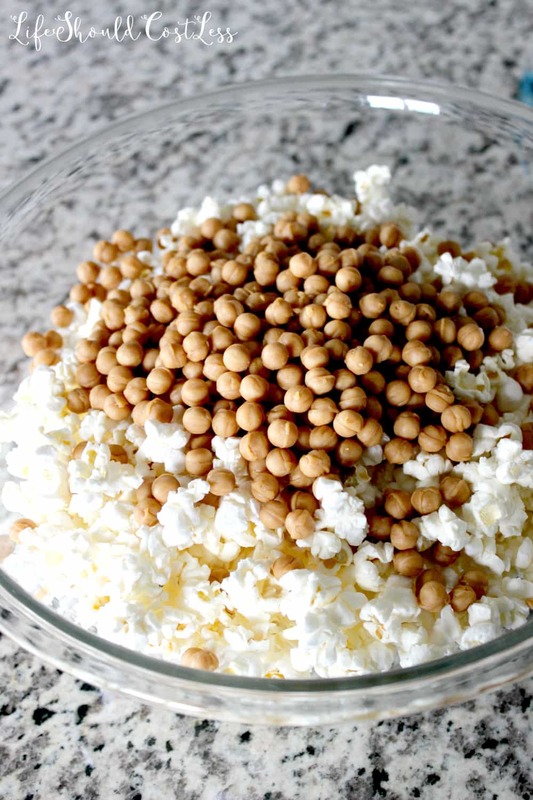 In a four quart or larger bowl add the popcorn with the old maids removed. 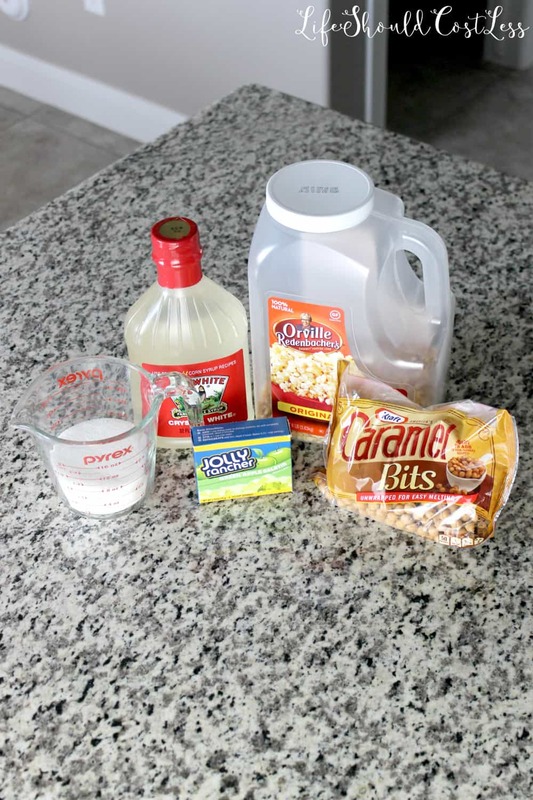 Pour the Caramel Bits over the popcorn, mix well, and set aside. 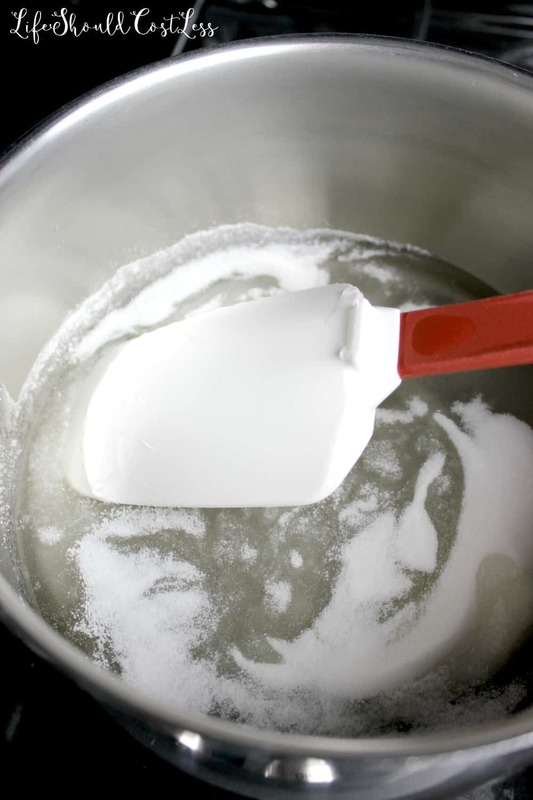 In a small to medium saucepan add the remaining ingredients over medium heat. Stir well and bring to a rolling boil for one minute. 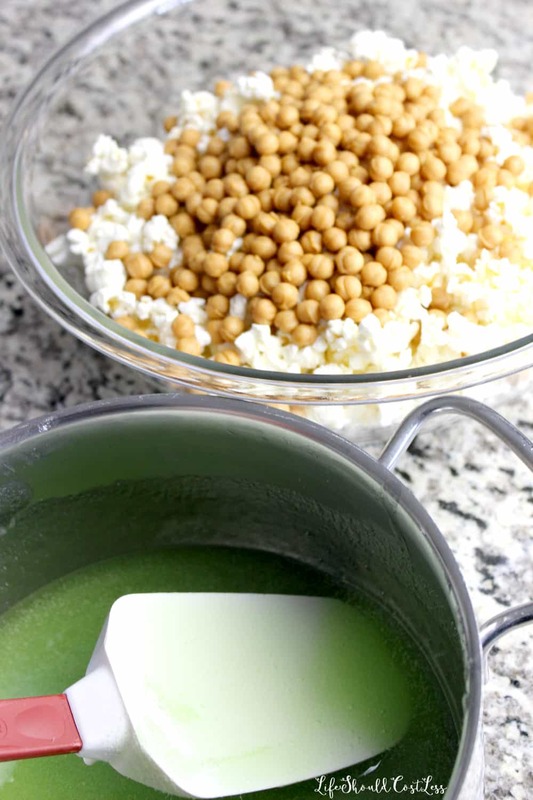 Remove from heat and pour over the previously prepared popcorn/caramel mixture. Stir until well mixed. Do this quickly as it hardens fairly fast. It's ready to serve after it has cooled enough to the touch. P.S. The offer that I put in on that cottage in my home town, I mentioned this here, got accepted and I am under contract scheduled to move in the day after my birthday!!! Please keep me and my girls in your prayers that everything goes smoothly. I have some big plans for the cottage, all will be blogged, so it will be a blast to live there and show you all how I make it my own. I want it to be like a fairy tale, so we’ll see if I can do so on a budget. Also, until after the move the new posts on the site may or may not mostly consist of cleaning tips and recipes because I’m not going to be doing any decorating or projects while I’m packing and unpacking. I should be back on track with posting the way I want somewhere between December and January.